Bet Steelers -8 over Browns with Karamba. Bet Lions -3 over Seahawks with 888Sport. Bet Ravens -2 over Panthers with Karamba. Bet Eagles -3 over Jaguars with 888Sport. The NFL betting season moves along with divisional races taking all sorts of unexpected twists and turns. We’ll start our weekly spread picks with a particularly intriguing one where the Cleveland Browns are just one win out of first place in the AFC North at the half way point of the season. It’s been a while since that’s been the case. 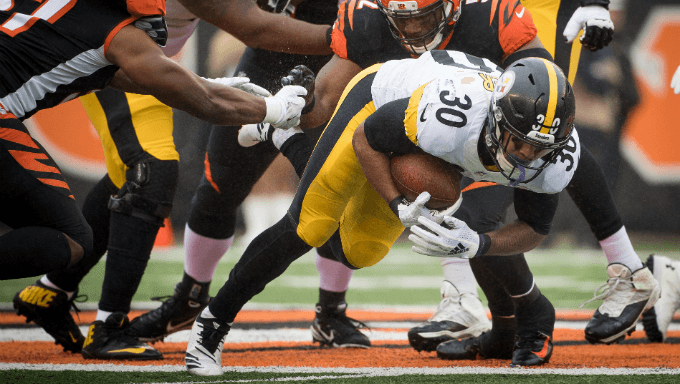 The Steelers could not beat the Browns in Week 1, so why should this meeting be any different? For starters, the Steelers won’t overlook this team. They know the Browns are improved and secondly, they know that they’re lucky to be where they are (back in the division lead) and any additional slip-ups will hamper their playoff hopes. Fatigue could genuinely be a factor here as the Steelers are coming off a bye while the Browns have played a lot of football of late. Three of their last four games have gone to overtime, which is a lot of extra work. And their defense has been scuffling of late too – often because they’ve had to play so much – allowing 29.5 points per game in that span. A rested, focused Steelers team should cover in this spot. Take the Steelers -8 with Karamba. The Seahawks have an average offense by most definitions, 17th in the NFL in points with 23.8 per game. They scored 31 points against the Los Angeles Rams but went 0 for 10 on third downs against the Arizona Cardinals and were terrible on the road in their other NFC North road game of the season at the Chicago Bears earlier in the season. You start doing the math and this team has won three of four, but those wins have come against the Cowboys, Cardinals and Raiders who are collectively 5-15. Detroit has also turned things around, winning three of their last four games. Their wins are a little more impressive, as they beat the Patriots, Packers and Dolphins on the road. Their offense is averaging 28.3 points per game in that span. I view their turnaround as more credible than Seattle’s. Combined with the home-field advantage, I like the Lions to win and cover the three points with 888Sport. I’m going to take a flier with the Ravens in this spot as I see them as the better of the two teams. Carolina did come to life in the fourth quarter last week, but when you take a look back, it feels like this team still has a number of flaws. Carolina needed a miracle 63-yard field goal to beat the Giants, then it was handled by the Redskins, and then needed a fourth-quarter miracle to come back and beat the Eagles. This team could easily be 0-3 in that span. Carolina still relies on its ground game a lot, as its passing offense is ranked 26th. The Ravens run defense is solid as they’re seventh in rushing yards per game allowed. This will be a close, ugly game with minimal points, but I like Baltimore’s defense and field-goal kicking to bounce back after the Ravens defense blew a 10-point lead and Justin Tucker missed an extra point. Take the Ravens -2 with Karamba. The Jaguars have arguably been the worst team in the NFL the past three weeks, as they’ve now lost three in a row while getting outscored 90-28. Blake Bortles has been as bad as he ever has been with the coaching staff benching him last week. While he’s back in the starting lineup, he has a very short leash. The Jacksonville offense is 29th in the NFL in points scored per game at 16.6 and the bigger issue is that they are missing Leonard Fournette. Remember, this is a team that was built around pounding away on the ground, winning the time of possession and making the key throws here and there when necessary. The plan was never to put games on Bortles’ shoulders. And the defense isn’t able to rest as much as they did last year as they’re on the field way too long. They were fifth in time of possession last year but are 27th right now. Meanwhile, the Eagles lead the league in this category. Take the Eagles -3 with 888Sport.